Ah les madeleines! Sometimes you just want to spoil yourself a bit. Maybe you are having a bad or stressful day and you need something… chocolaty maybe, to make you feel better. At the same time you don’t want to go overboard, go on a binge or spoil your diet too much. 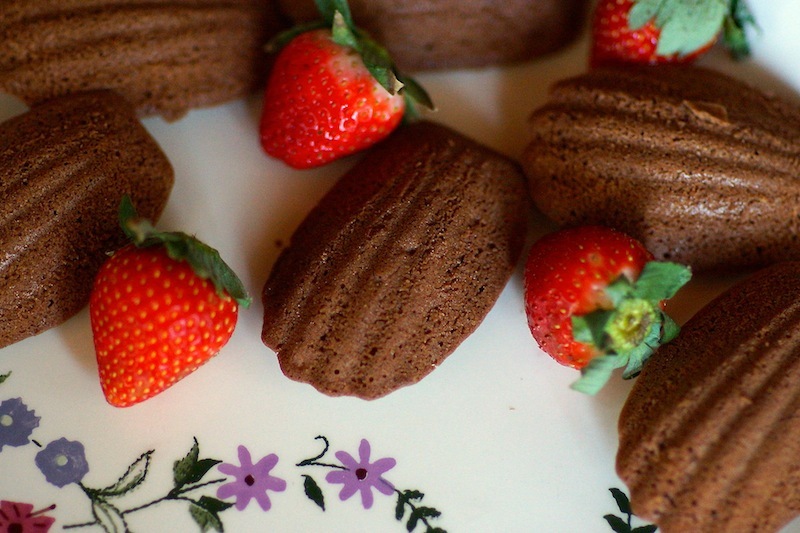 Madeleines are small and they look so charming. They are also hard to resist and really easy to make! This recipe by Gerardo Mendoza was adapted from a leading Mexican cooking magazine. Grease a 12 mold madeleines baking pan with cooking spray or butter. Preheat the oven to 190ºC/375ºF. Put the chocolate and butter into a heatproof bowl over a saucepan of simmering water and stir often until they are melted. Whisk together the cocoa powder, the sugar, the flour and salt. Fold it into the chocolate mixture. Beat the eggs, the egg yolks and the vanilla together. Fold it into the chocolate mixture and mix until well combined. Put the mixture into a heatproof bowl over a saucepan of simmering water and heat it for two minutes. Spoon the batter into the molds or use the help of a pastry bag if you want to be more precise, be careful not to fill them completely. Bake for 12 minutes or until they are golden and spring back when gently pressed. Remove the madeleines from the molds while they are still hot. They are such a treat! You can have them plain or with strawberries like I did.